Like Sleeping Beauty, wear this gown into the woods and not only will your furry and feathered friends sing songs with you, but you will attract the attention of a fine young prince! It's not a plot to be overlooked! 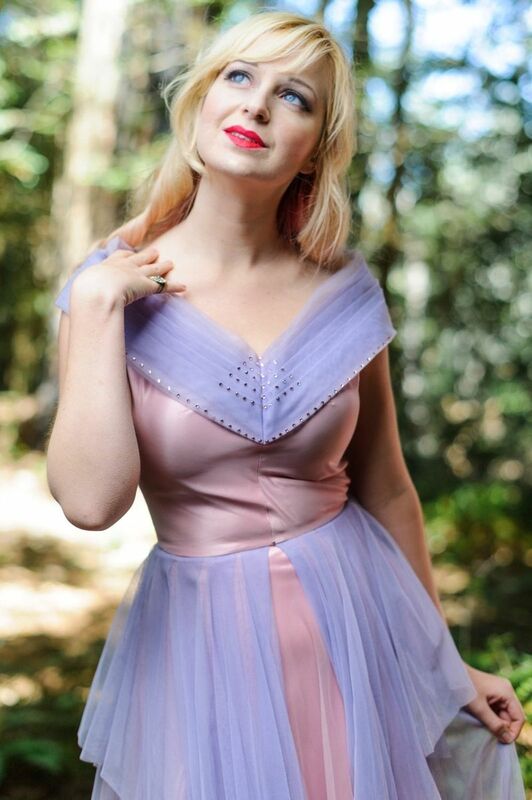 This is a one of a kind couture gown from the late 1940s made of pink silk satin with a pink fine tulle overlay and lavender tulle overlay on top of the pink. The neckline sits slightly off the shoulder with pleated folds of tulle covered in pink swarovski crystal rhinestones (which I added)! The skirt features tulle which is cut in a cascade which makes each layer different shades of pink or lavender. 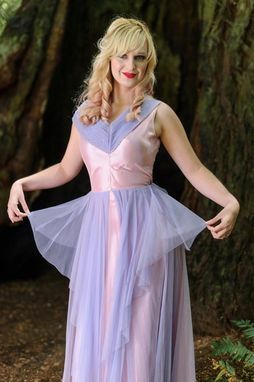 This dress zips up the back with its original working metal zipper, and the pleated tulle neckline has three hook ane eye closures at the back to secure it down. The dress is in PERFECT NEW condition! I dont think it was ever worn! It really looks as though it were just made, if not for the 40s sewing style and notions used. This dress is a real gem in a sea of plastic beads! Please give it a properly loving and useful home!